Blog Talk Radio had a hiccup that prevented podcasters from uploading their files, so The Living Kitchen did not air this morning as expected. However, today’s talk is so important that I wanted to go ahead and release it. 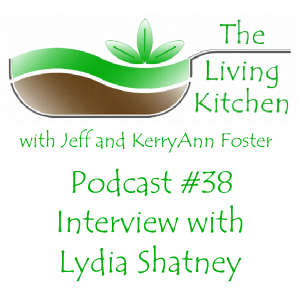 Today we’re talking gut health with Lydia Shatney. Lydia has a class on gut health that begins today and is open for enrollment through tomorrow. UPDATE: Due to the problems with Blog Talk Radio this morning, Lydia has graciously offered to keep registration open through April 15th!!! Don’t miss out on this wonderful class! I’ve personally taken this class from Lydia and I can tell you it’s full of great content to help you heal your gut and improve your health and your digestion. Click here to learn more about Lydia’s Class! 'A Calm Mind: Healing Your Moods by Healing Your Body' Early Registration Discount!